The Slingerlands Fire Department is currently recruiting NEW MEMBERS / VOLUNTEERS. FREE TRAINING included with your membership for all classes of firefighters. Here we are practicing our Ice Rescue skills. It's one of our most enjoyable drills! The first 6 photos in the slideshow are courtesy of Sidewinder Photography. Thank you, Sidewinder. We had a scary good time! That coming out for our Open House in October. It's always fun to meet the people we serve. On October 6 The Slingerlands Fire Department participated in a muster at the Fort Hunter Fire Dept. A muster is an event where fire departments compete for trophies fro best appearing apparatus and personnel. Thanks the hard work of our members, we won 3 trophies, including the Walter W. Eck trophy for best appearing department overall. thanks to Tom Marra for the use of his excellent photographs. On August 7 at the Town of Bethlehem Night Out in the park the Slingerlands Fire Dept. demonstrated how we would remove a victim of a car accident from their vehicle. Thanks to all who attended this event, and to the Bethlehem Police Department for organizing it. Photos by Briana Tice and Thomas Marra. The Slingerlands FD recently had 2 drills to practice water supply operations. When fire hydrants are unavailable or not functioning properly, water must be brought in by tanker trucks to fight the fire. One of the drills was hosted by the New Salem FD and participating departments included Altamont, New Salem, Knox, Guilderland Center, Voorheesville, Berne, East Berne, and Onesquethaw. Antique pumper used strictly for parades and other functions. This pumper was delivered in 1942 and served a term of twenty four years. This piece was then sold to one of the members, Thomas Smith. After Mr. Smith’s passing, the Smith family graciously donated the piece back to the Fire Department in 2001. After many tireless hours of cleaning, polishing and some minor painting the “Old Girl” is the pride of the Department. On June 27, 2018, our fire department lost George Lenhardt, who was a member for over 50 years. George was served on the Bethlehem Town Board, the Planning Board, and many community organizations. He was on the Slingerlands Fire District Board of Commissioners, serving as Treasurer. Whatever he did, he was always trying to figure out how things worked and how to improve them. We really miss his smile and laughter atound the fire house. Here is the link to his obituary. We would like to pass along some useful fire prevention and safety tips. Reviewing this information with our families could make all the difference in the world. The Slingerlands Fire Dept. appreciates your support of our annual Chicken BBQ with delicious chicken dinners provided by Giffy's. The event was a success and we're sure you all enjoyed your meals! On behalf of the Slingerlands Volunteer Fire Dept., I would like to thank everyone for helping us raise funds for our firefighter Lt. Fred Chamberlin at the Pancake Breakfast on February 25. The funds that were raised will be a big help to Fred during his recovery. Fred is one of our most valued members, and he has given many years to the volunteer fire service. During this difficult time for Lt. Chamberlin, your support really means a lot to Fred and the rest of our Fire Department, and we deeply appreciate it. On April 29, Roger Griffiths and Peter Schmidt drove our old Engine 11 to Erie, PA to deliver it to its new owners, the Laurel Fire Department in Illinois. 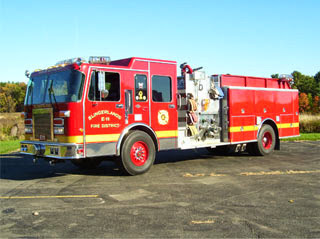 has been a great truck and it has served the Slingerlands Fire District well since 1991! our new Engine 11, which has replaced the old Engine 11 as our first engine out for structure fires and vehicle fires. The new engine allows us do our job more effectively and safely. Haunted House and Halloween Party at our fire house. We had a great time and we're glad you did, too. On May 31, 2016, Bethlehem seniors got a sobering and very real reminder of the dangers of impaired and distracted driving as the BC chapter of SADD and several community agencies teamed up to stage a "mock" DWI crash at the school. The Slingerlands Fire Dept., along with dozens of other first responders and student volunteers made this important event possible. Walter W. Eck, Jr., Michael Brodeur, and Len Clickman are also serving on the Board of Fire Commissioners. Thanks to Roger Griffiths for his many years of service as a Commissioner. Halloween Party and Haunted House a success! Thanks to everyone who attended our recent Halloween events. Over 300 brave souls made it through the haunted house, and our bounce house and refreshments were a big hit at the Halloween Party. We're already looking forward to next year! On August 21 the Slingerlands Fire Department lost one of the most outstanding members in our history when John Flanagan passed away. Serving as President, Chief and Commissioner, he was warmly know as "Father" to his fellow members, and was an inspiration to us all.